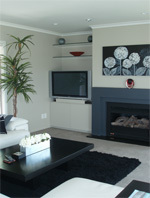 Goode Interiors has completed many home renovation and new build projects in Auckland. Goode Interiors worked very closely with the builders and home owners on this extensive refurbishment project providing high quality cabinetry throughout the home. Consultation with an audio visual specialist was required to ensure all the high-tech componentry was accommodated in the design. This delightful house was totally refurbished in a contemporary style sympathetic with its 1950’s origin. Goode Interiors was able to work closely with the architect and home owners to produce a very stylish and functional interior for this busy growing family. A new build project, Goode Interiors worked alongside the owners to provide plans, colour selection, manufacture and installation of their kitchen, laundry, wardrobe and office. Aswell as working through tile, carpet, cork flooring and interior colour scheme to create an intergrated contemporary home which the owners love to live in. A Herne Bay villa had been on the market for some time with no offers. Wendy Goode was bought in to work through potential solutions to create a more saleable property. With a very tight deadline Wendy put forward a number of solutions to reconfigure the Kitchen, laundry and family room area. Within months work was finished the property was sold and the owners were moving on to their new residence. The owners of this classic Mt. Eden Bungalow with very little storage employed Goode Interiors to reconfigure the kitchen, laundry, bathroom and family area. The result was a successful blend of old and new with a much improved use of the space available with a more logical connection to rooms and increased storage. After 10 years of thinking about it we finally got around to replacing our kitchen. Wendy was there from beginning to end. She really listened to what I wanted from my kitchen and suggestions were always practical. She found out how I liked to work as a cook and what I needed space for. I have a lot of appliances and Wendy accommodated all of these in her design. She was fantastic in suggesting colour choices for the kitchen cabinetry, walls and ceilings along with vinyl and carpet selections, they really have been spot on. Wendy's suggestions were current but practical and she was extremely patient. I never felt pressured and Wendy was happy to work around my work schedule to meet with me. I love everything about my kitchen. Everything is perfect and I wouldn't change anything. Wendy we really appreciate your input into our project including all the colours, flooring and tile selections and window treatments. Everything you touched has delivered on the promise so well done!We are also extremely pleased with the lounge suite that you helped to select for us, which is absolutely perfect in terms of size, functionality and colour. It also goes perfectly with our new outdoor setting.